Needless to say, traditional networking isn’t working anymore. For successful 21st century business people, large networking events and the mountains of business cards they produce have become a waste of time and valuable resources. It's time for a new, modern approach to networking. 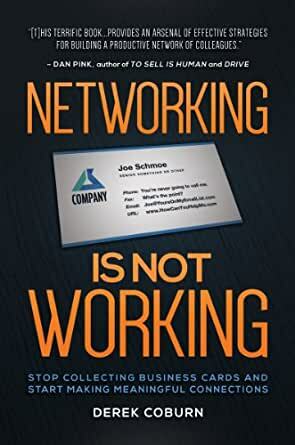 Once you implement the networking strategies in this book, the quality of your clients, your business, and your life will improve dramatically. 1.0 out of 5 starsDon't waste your time. Get "How to be a Power Connector" instead. This book goes on and ON about how traditional networking doesn't work. Fine. That's the title, but enough already, get on with it. Tell me what *does* work. Okay... adding value and building relationships, cool. Other authors talk about that too. Let’s see what he adds to that topic. When he gets to the meat of how to put this into action, his advice is so impractical, so useless, it’s utterly ludicrous! The only concrete advice he gives the reader is to take on the huge job of organizing a networking group, that’s it. He goes on and on about how to choose the members, how to contact them, organize them. He even has a chapter on how to choose a restaurant for the meetings. Detailed explanation on why we need a private dining room so there is enough quiet for people to be heard. But NOT A SINGLE WORD on what to talk about when you get there!! Not a word about WHY these people should want to get together with you, WHAT would make it worth their time, and barely a word about WHAT the heck you should be doing at these meetings. Please...I'm telling you, I wasted my time reading all the way through this book, hoping to find something of value. Instead, read “How to be a Power Connector: The 5+50+100 Rule for Turning Your Business Network into Profits”. Judy Robinett is the real deal. Her resume is jawdroppingly impressive, and the tone of her writing is generous and eminently practical. It took me a long time to read her book,not because I found it tedious (far from it), but because I was highlighting every - other - sentence. It is *packed* with concrete advice, all of which I definitely plan to implement. She even makes all the same useful points that “Networking is Not Working” makes --only she does that better. Trust me. “Networking is Not Working” is..not.. working. One of the things I learned early on in life is the principle of "pay-it-forward." Generally speaking, it's the idea that we should do nice things for others with no expectation of getting paid back. I have found that this principle worked well for me in much of my life, but when I started my own business, it - remarkably - stopped working. Like many owners, I kissed a lot of frogs looking for that princess in the first few years that I was in business. I gave, and gave, and gave, and pretty much never got anything back. In the purest sense of "pay-it-forward," I shouldn't care, but a business needs to make money. So, the longer you go without getting a payoff from your "go-giver" networking efforts, the more disenchanted you become, and you stop networking. However, that's a problem - the most effective way to market your business is through networking, but only if the networking works. As a business coach, a business writer, and an interviewer, I've run into dozens of CEOs who have given up completely on networking. They advertise, cold call, sponsor events, and pump out proposal after proposal, but keeping their pipeline full is a much more expensive proposition than it needs to be. If they would instead master real networking, or un-networking, not only would they reap the financial rewards, but they would reap the friendship rewards as well. Derek Coburn's book offers a pithy, step-by-step process to help any business owner or business development professional create and maintain the kind of network that delivers those rewards. Derek's process works; I've known him for about 5 years and have been a member of his cadre group since he and Melanie started it. FINALLY with Cadre I am associated with a group of people who will take the time to get to know one another and will take the time to help one another. This is thanks to Derek's vision and leadership. If you want to take advantage of the most efficient, and most successful, way to grow your business - networking - then don't delay reading Derek's book on how to do it right. He writes from personal experience, an experience I can vouch for, and he provides a step-by-step process that anyone can implement - if he/she is willing to do the work. Derek and Melanie didn't sit around eating bon bons - they worked hard to build Cadre. It is, after all, netWORKING, not netLOUNGING. I final word on business books. I have many of them, but I don't read many of them. Why? Because 50% - 75% of the pages are fluff, and I don't have time for fluff. I only have time for "how I did it" biographies and "how to do it" practical application books. Derek's book combines both, with no fluff, which is why I will be buying this book for my clients. "Networking is Not Working" has my highest personal recommendation and endorsement. The book (which only takes a few hours to read) is the story of how Derek Coburn designed his network. I think that the book is not that practical for a lot of readers though, and mainly focuses on entrepreneurs who are already a lot of years in business. Coburn bashes on other network books, but often forgets to explain why certain concepts should work in a specific context. He also assumes that everyone is able to follow his example. This is simply not true for a lot of people. I like his approach on how to be of more value to your clients. And that the stronger connections, combined with the reciprocity principle, lead to more clients for yourself. In sum: it’s a nice read and Coburn comes with some valid points. However, this book will not be practically relevant for a lot of readers. I have networked for many hours. I have read a lot about business networking. I have taught business networking. I have never before heard of the techniques in this book. This is new and powerful. Even better, every action suggested in this book is sincere, generous, and appropriate for respectable professionals. The book is also mindful of our contemporary communications environment, e.g. the death of telephone calls and the rise of social media, while relying on the timeless value of face to face communication. Buy it, use it, and prosper. If not for your own good, for the benefit of the people with whom you network.